This time of year those who live for Halloween and take pleasure in getting their pants scared off are planning their spooky events and gearing up for another creepy year of zombies, ghosts, and witches. The scary stories are shared and visits to haunted houses and abandoned buildings become popular destinations. When Halloween is over, everyone will forget about the haunted, abandoned buildings until next year. That is, except for Edinburgh Manor. Edinburgh Manor in Scotch Grove, Iowa, is a real-life haunted, abandoned insane asylum. You may have heard about it. It’s one of the most well-known of its kind. It’s chilling history dates all the way back to the early 1800’s. Originally intended as a courthouse, it was redone to become a “poor farm” which would be a “comfortable retreat” for poor people described as “lazy, able-bodied and willingly independent applicants.” Though this was an interesting description, it sounded like a seemingly pleasant place to live. Those who lived there were asked to farm the land in return for their room and board. In reality, the house held those who were thought to be insane with no cure and those with disabilities ranging in severity. There was a cemetery on site for those who passed. Between 1850 and 1910 – when the house shut down – there were 80 documented deaths, many of which were from strange causes. It is said that the spirits of the dead still roam the property at night. When the house closed, it was torn down and Edinburgh Manor was built in its place. Edinburgh Manor also housed those who had an extreme mental illness, disabilities, and the elderly. For anyone who is interested in touring this haunted asylum, overnight visits are available. They start at $200 for one to five people. But be warned, previous investigations of the asylum have ended very badly. There have been numerous accounts of supernatural activity since the building was opened for investigations in 2012. 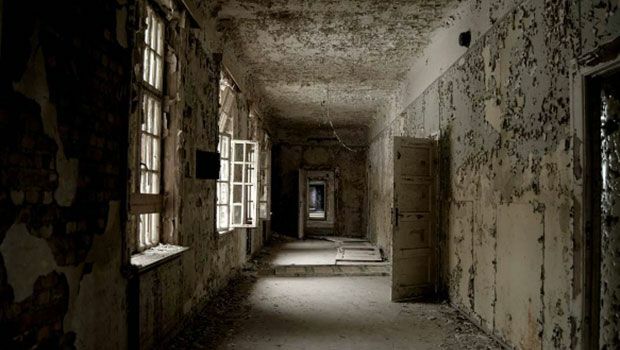 Though the asylum was shut down in 2010, after running for about a hundred years, by the looks of what was left, the residents and employees left in a hurry. It didn’t take long for the building to fall into disrepair. Paint is peeling from the walls and there is evidence of water damage. However, everything seems to be in place as if they all were expecting to return. Beds are still made, furniture is still in place, and personal belongings still sit in the rooms. There are even patient files and medical documents left out. What really makes visiting this place terrifying is the many experiences of visitors. People report lights turning on, voices and singing, whistling, and even plates flying across the room. And if that all sounds pretty freaky, then hold on to your britches. The abandoned property is not just home to wandering, restless spirits. There is a very evil spirit there that is known as the “Joker.” It has been known to choke visitors. Many paranormal teams have investigated the property and have found plentiful evidence for everyone’s reports. Whether or not you believe in ghosts is another story. Are you feeling skeptical? Perhaps a visit to Edinburgh Manor will sway you. SHARE this amazing destination with anybody you know who loves abandoned buildings.